Come Back Paddy Reilly to Ballyjamesduff was written by one of Ireland’s greatest songwriters, Percy French. The Paddy Reilly mentioned in the song was a jarvey or coach driver who often drove French to appointments in the Ballyjamesduff area. 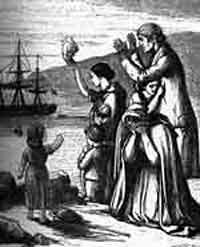 When French returned to Ballyjamesduff after a short period away from the town, he discovered that Reilly had emigrated to Scotland. The thought of so many young Irish people being forced to emigrate in search of work saddened French and he wrote the song as a kind of lament for them. On one level the song is about Ballyjamesduff which is described as being a latter day Garden of Eden, such is its beauty. As French describes its charms, he appeals to Paddy Reilly to come back to his homeland to enjoy what it has to offer. On a more general level, the lyrics can also be taken to refer to the whole of Ireland with Paddy Reilly being a sort of Irish everyman. The plea is therefore a more general one to all the millions of young people who had emigrated. French knew such a thing was impossible but the song captures the sense of sadness at so many having to leave such a wonderful country. He had personal experience of such heartache as he was planning to emigrate himself to Canada in search of work but was offered a job with the Irish Board of Works just as he was about to leave. Had French emigrated, the song about Paddy Reilly may never have been written. According to his family, Paddy Reilly wasn’t particularly interested in the fact that the song had been written about him, even when he heard it being played. In an interview with the singer Brendan O’Dowda for Irish television, Reilly’s daughter Bridgit Quinn said he hardly remembered French, and never mentioned him. Reilly had just regarded French as another fare and of no particular importance. This would suggest that the men didn’t know each other as much as the song implies. 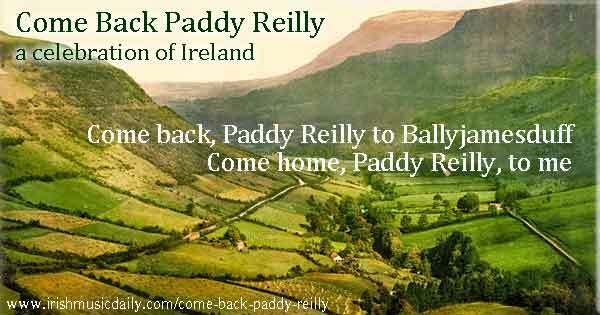 It could be that French simply used Paddy Reilly as a name to personify all of Ireland’s emigrants. According to his daughter, Brigit Quinn, Paddy Reilly was quite an impetuous man who made decisions on the spur of the moment. One day, disillusioned with work prospects in Ireland, he decided to emigrate. Reilly returned several years later and is now buried in the local cemetery. 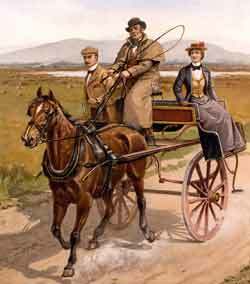 Come Back Paddy Reilly to Ballyjamesduff presents an idealised version of Irish rural life, full of wonderful characters leading colourful lives. Some of the characters mentioned were actual people that French had met or heard about. Some even feature in other songs. For example, Phil “wid his flute” is the musician featured in French’s song. Phil the Fluther’s Ball. Percy French is best remembered today for songs like the Mountains of Mourne, but Come Back Paddy Reilly to Ballyjamesduff is also very popular and has been recorded by several leading performers.